The sixth annual conference in Belfast in October 2008 demonstrated the effective role being played by SCoTENS in stimulating discussion among a wide range of participants on one of the most challenging issues facing education systems internationally. 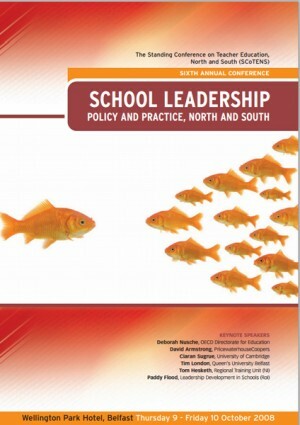 Based on the theme ‘School Leadership, Policy and Practice, North and South’, the conference addressed the importance and impact of leadership in schools from varying perspectives, with reference to the inherent challenges facing both jurisdictions. In her opening comments the Northern Ireland Minister for Education Ms Caitríona Ruane MLA recognised the significance of the conference theme as she underlined the central role that principals and school leaders play in improving the efficiency and equity of schooling. Ms Fern Turner, National Association of Head Teachers (NI).